In The News | Aero Mock-Ups Inc.
FROM THE very first days of the movies, airplanes and airports have been the backdrop for stories of love, horror, comedy and action, but if you’re a director or producer, where exactly do you go if you want your stars to film in a 747, snag a seat inside Air Force One, or fly down to Rio in a Lear jet? The answer isn’t at LAX or any other airport – it’s right on terra firma at an anonymous warehouse in North Hollywood. Behind these doors lives a crucial player in Transformers: Dark of the Moon, Friends with Benefits, The Hangover Part II – all massive movies recently in theaters – while later this year they’ll be seen in the US remake of The Girl with the Dragon Tattoo and George Clooney’s latest, Ides of March. 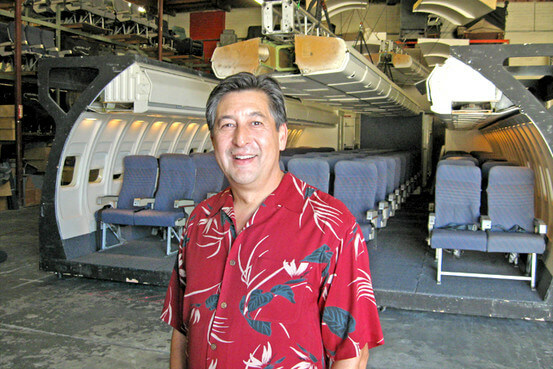 Aero Mock-Ups, Inc founder and former pilot Richard Chan bought his first airplane interior in 1987, and soon after he acquired two more from the “747 stage” at Universal Studios. His haul from that legendary studio included the cockpit from the classic spoof Airplane!, though this mysterious clue – which now sits by the front gate – is only the beginning of a story that started over 20 years ago. The entertainment industry has long had an out-sized interest in airplanes and airports, playing off the fears of crashes, the comedy and frustration of airlines and travel, the pain of separation and the joy of reunion, or just moving stories along by moving characters around. Airplanes are a good backdrop for dialogue, for chance encounters and, of course, for comedy. But using real jets or stocking airplane equipment at studios is expensive. So airplane and airport sets have been outsourced to two companies—Air Hollywood in Pacoima and Aero Mock-Ups in nearby North Hollywood—that specialize in flying scenes. They bring air travel to life on the screen without leaving the ground.